We're not JUST a studio! Whether you're planning a wedding dance, need dancers, or a beautiful location to hold your event, check out what Premier Dance has to offer! We have what you need, whether you want a simple, elegant 'first dance,' a father-daughter or mother-son dance, or even a dance for the whole wedding party. Take a look at our video gallery to get an idea of the different dance styles we teach. 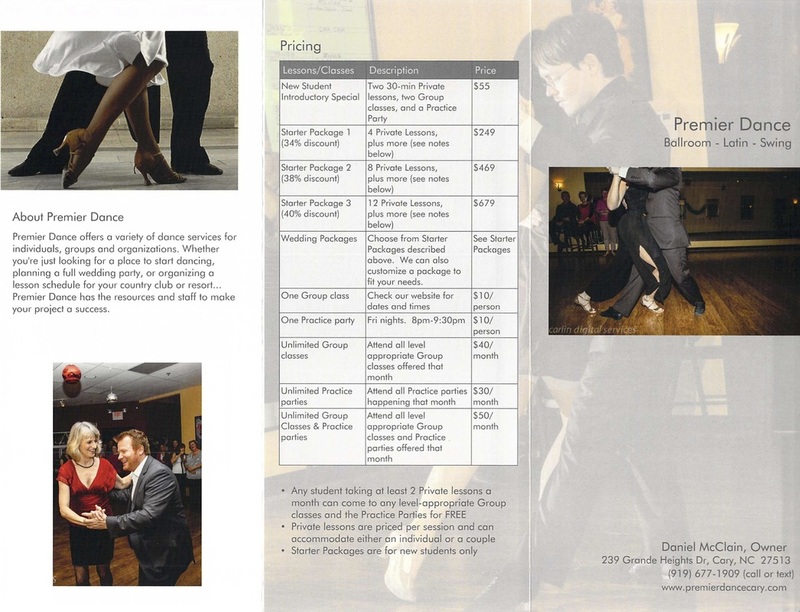 To view pricing options, check out our Wedding dance page. Wedding couples may choose from any of our available Starter Packages (4-, 8-, or 12-lesson packages). If you have specific needs that differ from our standard packages, send us a message and we can customize a package to fit your needs. We can perform stand-alone dance demonstrations or provide exhibitions planned in concert with other live entertainment and music. We will work with your group to accommodate your specific requirements. Give us a call or send us a message so we can work out the details. Dance lessons are great for team-building and out-of-office bonding time. 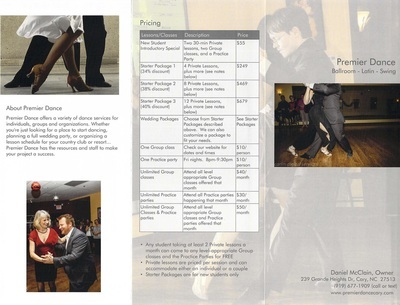 Let Premier Dance tailor a private group class for your company, church group, social club, sorority, fraternity, etc. Give us a call or send us a message so we can work out the details. Click on the images below to view our brochure, or download the PDF to print.